It surely can’t be a year since the Stanton brothers were here again visiting their grandparents John Putson and his wife. Oliver above who won the Saturday Junior Trophy came with his brother Felix who is a budding gymnast in Dubai. L to R: Cory Roberts, Daniel Bennett, Dillon Revell, Paul Drinkhall, Brandon Dillon and Pamela Lowther. Some of the Saturday Junior players had a surprise today when Paul Drinkhall popped into the club. Paul, who started his playing career at the Ormesby club, was in the area with a film crew and really made the youngsters day when he posed for pictures with them. Thanks Paul for kindly making the young players day. Pictured above is 8 years old Eliza Hannaway who won the Junior League Trophy on Saturday 8 October. 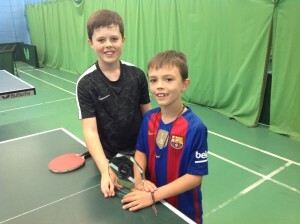 On holiday from Dubai, Oliver aged 10 and Felix Stanton aged 8 paid another visit to the Ormesby Table Tennis Saturday Club. The boys have been encouraged to play table tennis by their grandfather John (Putson) a member of the Ormesby 50 Plus players. Felix who is a keen gymnast, was awarded the Saturday trophy for showing the most improvement. 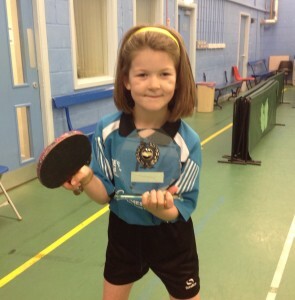 8 year old Tia Green was awarded the Ormesby Table Tennis Club, Saturday morning trophy. 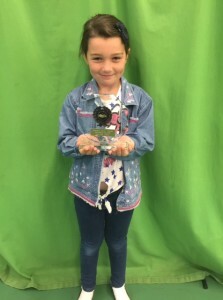 Tia who has just started playing table tennis was presented with the trophy for her patience and improvement throughout the morning. Pictured left to right are four of the Saturday morning players, Harry Muir, Aaron Davidson, Alan Edwards and Ryan Durnall. One of Ormesby’s up and coming juniors Jack Dewar met Darius Knight who was playing for Ormesby’s British Premier League team on the final weekend of the season on March 14th and 15th. Bethany Wardell, undefeated in all her games on Saturday 24 January 2015 is pictured above with the Junior Club trophy. Bethany who plays for the Ormesby L team in the Middlesbrough & District Table Tennis League also likes playing football and badminton. Kieran Wardell, Bethany’s younger brother is a member of the Ormesby Talent Development Squad. 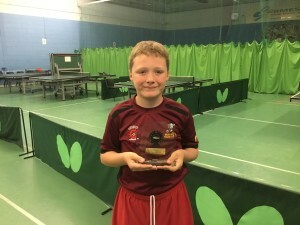 More success for two of Ormesby ‘s Saturday Junior Club players. 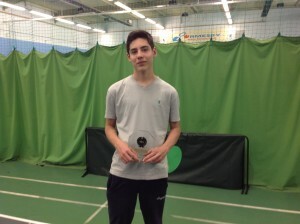 Jose Bosomworth won Group Two in the Super ten held at the club on Saturday 29 November. In second place was Chris Edwards and third place Katie Peacock from the Darlington Table Tennis Academy. The boys all regularly attend the Saturday morning Junior Club and are now being coached by Denis Neale and Alan Ransone in the Ormesby Hopes sessions. Chris Edwards pictured above, who is a regular player at the Saturday Junior Club and also Ryan Nassau’s table tennis sessions, was really pleased to meet Paul Drinkhall who posed for a picture with him when he came to support his wife Jo at the first British Premier League weekend of the 2014 – 2015 season. Paul, who began his playing career at Ormesby Table Tennis Club when he was considerably younger that 12 years old Chris, was happy to pose for pictures with Jo and their lovely little dog Millie. Michael Jones pictured above over came some stiff oposition to win the 2014 Cleveland Closed Handicap event. 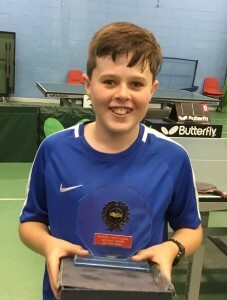 This was after he had finished in second place in both the Cadet Singles and Banded Singles where he had lost to Kaine Macdonald and Bruce Lowther respectively. 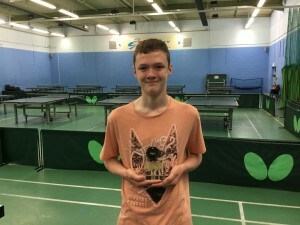 In the Handicap final, Michael, who was receiving a 12 points start per end, had struggled with runner up Michael Young’s heavy top spin and lost the first end 18 – 21. In the second end Michael coped much better winning 21-19. 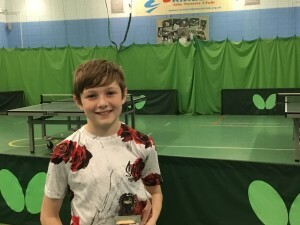 By the third end both Michael’s were playing some tremendous rallies with Michael Jones winning 21 -13. .
Congratulations to Jake Horsman (pictured above) who won the Ormesby Saturday Junior Trophy on Saturday 8 February. The runner up was Jack Dewar who can be seen pictured below with Jake. Above are some of the Ormesby Saturday Junior Club players from left to right Alex Wilson, Michael Jones. Aidan Daggett, Jack Dewar, Adam Gent, Jake Horsman, Joe Bosomworth, George Hill and Nathan Dale. Winner of the Saturday trophy was George Hill with runner up Adam Gent. 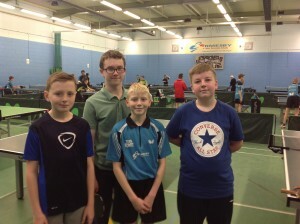 After the junior club ended most of the players stayed on to play in the National Junior League along with Josh and Charlotte Weatherby, Jonathan Crossman, James Dale and Kieran Wardell. 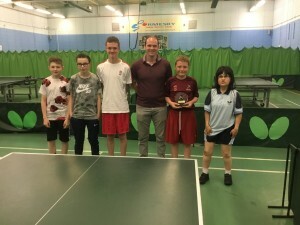 When the new 2013/14 season of the Middlesbrough and District Table Tennis League began on Monday 7 October, several youngsters from the Saturday morning junior club started playing in their newly formed Ormesby J team. 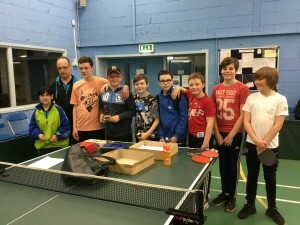 Jake Horsman is the secretary of the Ormesby TTC J team and as well as Jake the other players are Aidan Daggett, Kay Johnston, Jack Dewar, Adam Gent, Joe Bosomworth, Alex Wilson and George Hill. Although the boys lost their first match 10 – 0, they were not too disappointed as they know they will improve over the coming months and realised that they were in fact playing against a team who were much more experienced. All the players really enjoyed their first taste of League table tennis. We wish the team Good Luck and hope they soon have their first win. Pictured above are two members of the Ormesby Saturday Junior Club who along with Brian Holloway of the Ormesby Wheelers team took the first three places in Group 3. Alan Ransome, Ormesby TTC chairman presented the three player with their prize money. Second left in the picture is Jack Dewar who came first in Group 3 and won £25. On the left in the picture is Jake Horsman who finished in third place after a count back with Ormesby Hopes player Katie Ashwell and Jake won £10. Well at least James didn’t come to play his Middlesbrough League match wearing his red nose. James who plays for Ormesby Hopes C had been helping to raise money at his school for ‘Red Nose Day’. The Under 16 Boys team from Rye Hills Community College, Redcar finished in second place at the Cleveland Schools (south) team event held at Ormesby TTC on Wednesday 9 November 2011. Three of the team, Ebrima Camara, Ethan Southall and Mathew Hiser all play regularly at the Saturday Junior Club. 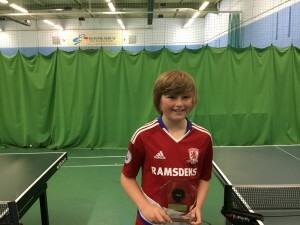 Ormesby’s Saturday morning junior club player Wayne Parker won his first table tennis title when he defeated Adam Barlow of Northfield TTC to take the Division Three title in the 50th Summer League Table Tennis Tournament played at Ormesby TTC on Sunday 27 June 2010. Wayne aged 15 and his younger brother 11 year old Cameron are now attending coaching sessions at the club on a regular basis. Wayne who attends the Sacred Heart School in Redcar, lists running as another of his sporting interests with his favourite race being the 1500 metres at which he holds the fastest time in his school. Brenda Stephenson and Gary Whyman run the Saturday Morning Junior Club and Ormesby Junior League at the Club between 10.00 am and 12 noon on Saturdays. This session includes warm up exercises, matches and fun activities. A qualified coach attends regularly when players can have individual coaching if they wish. This is an ideal introduction to the sport and the Club for beginners between 7 and 17 years. The session fee is £2.00 for members and £2.50 for non members. Contact Brenda on 01642 310163 for further information.